The the king gave orders, and Daniel was brought in and cast in the lions’ den. The king spoke and said to Daniel, "Your God whom you constantly serve will Himself deliver you." Daniel was set up as Jesus was. Are you being set up in one of the enemy’s traps today? The king was not a believer, but Daniel’s life had convinced him Daniel’s God would deliver him. He states twice in Daniel, chapter 6, "Your God in whom you constantly serve." Daniel’s devotion of praying 3 times daily and constantly serving God resulted in a king and his nation being followers of the one true God. Where are the Daniel’s today? Let our devotion and trust be as Daniel’s. May our devotion impact those around us to come to the one true God. He alone is worthy. 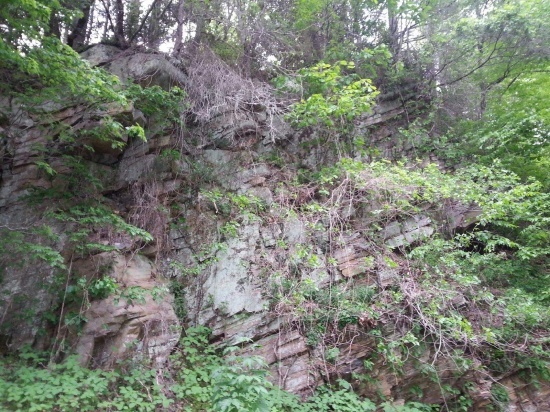 Rugged rocks are a common sight on New River Trail I always enjoy.